This rum Saint James comes from one of the oldest distillery of the Martinique Island. This Saint James rum vintage 1765 comes from one of the oldest distillery of the Martinique Island. It was indeed created 250 years ago. This special vintage is a tribute to the creation of the brand. 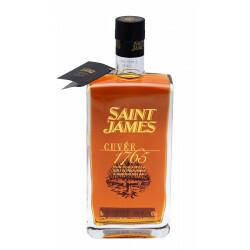 The Saint James 1765 is a blend of rums selected and matured in little barrels during minimum 6 years. It is an old rum. The distillation method used for its production is the one with a column still. Displayed in an elegant square bottle, this vintage benefits from the french certification AOC ("Appellation d'origine controlée" in french or "name of controlled origin"). Nose: spices, roasted notes, macerated fruits.